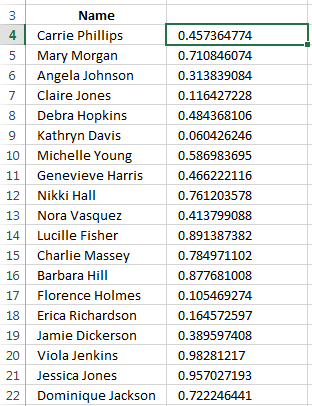 Randomizing the rows in Excel. Entering formula in cell B4. 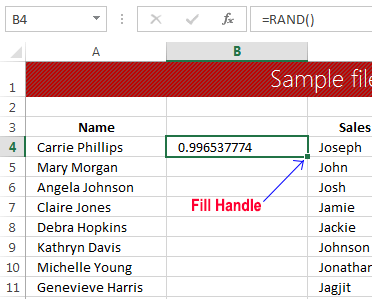 To copy this formula to other cells of column B, just click on the Fill Handle, hold your mouse, drag down until you have reached the cell B132 in our example. Or you can use this technique. Click on cell B4. While clicking cell B4, press Shift and use navigation arrow (⇓) to reach cell B132. 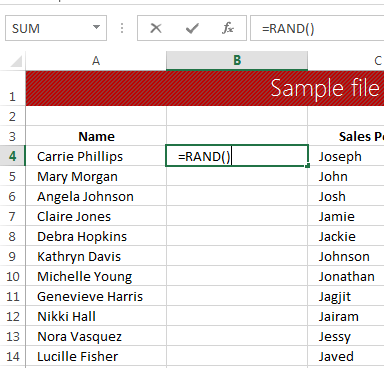 Cells are selected, now click CTRL+D to auto fill all cells (you have selected) with the formula in cell B4.